High quality liquid soap: Cleans without damaging even the most delicate surfaces. For use on all types of surfaces including travertine, limestone, sandstone, slate, marble, porcelain, granite, terracotta, quarry tiles & flagstones. A gentle cleaner containing a trace of linseed oil especially formulated to clean without damaging the most delicate surfaces. Has a fresh, clean fragrance. Ideal for use on surfaces that are protected with LTP Mattstone, LTP Colour Intensifier and LTP MPG Sealer. 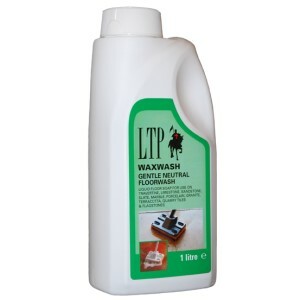 1 x 1 ltr of LTP Waxwash will clean an average 20m� floor approximately 40 times.